As we have discussed many times, your adrenaline-driven mind has taken control, and your “fighting Parkinson’s” is calming down that mind and opening up your your dopamine-flowing heart. Recently, I was reminded of a short story that drives home this point. Here it is. “One evening an old Cherokee Indian told his grandson about a battle that goes on inside people. He said, ‘My son, the battle is between two ‘wolves’ inside us all. 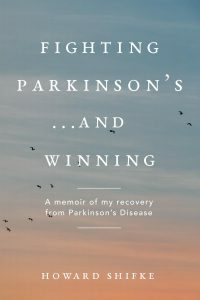 The “fight” against Parkinson’s by doing the Parkinson’s Recipe for Recovery® has three components: the body (physical) part to heal your internal organs, the mind part to calm your adrenaline-driven mind, the soul part to open your dopamine-flowing heart. Feeding the Evil Wolf is what helps bring Parkinson’s symptoms to the surface. Once you have Parkinson’s, continuing to feed the Evil Wolf exacerbates the symptoms and sends the disease in the negatively spiraling direction. All of you would agree that when you are feeling the emotions exhibited by the Evil Wolf in the story above, your symptoms appear worse. Feeding the Good Wolf is what helps bring Parkinson’s under control all the way to your full recovery, your cure. When you calm your mind, you are starving the Evil Wolf. He does not like this because he likes being in control. So, he “bites” you in the form of a bigger tremor, more stiffness, more slowness, and some worse balance. However, if you calm your mind, you will realize that his “bite” has no teeth. In meditation and sleep, symptoms slow down or disappear, clearly proving that if your mind is calm, then the Evil Wolf’s “bite” has no teeth and cannot hurt you…you are not getting worse. However, if you open your heart fully and find joy, peace, love, hope, serenity, humility, kindness, benevolence, empathy, generosity, truth, compassion and faith, you will realize that his “bite” has no teeth. In meditation and sleep, symptoms slow down or disappear, clearly proving that if your heart is open to yourself and others, then the Evil Wolf’s “bite” has no teeth and cannot hurt you…you are not getting worse. The challenge is maintaining this same calmness of mind and openness of heart in your everyday life. It is a new way of living…from your heart! You do not “fight” Parkinson’s by beating it down with a stick. You “fight” Parkinson’s by healing your organs, calming your mind, and opening your heart…feeding the Good Wolf. And then, the Evil Wolf simple drops off, like dropping off some dirty, toxic clothes and stepping into your dopamine bath. Choose joy, peace, love, hope, serenity, humility, kindness, benevolence, empathy, generosity, truth, compassion and faith. Feed the Good Wolf, and watch your full recovery roll out in front of your eyes. Note: Don’t forget, I am providing a special offer of a discounted cost for Parkinson’s Coaching if you sign up by the end of June. Click here to learn more about Parkinson’s Coaching, including how to sign up for the One-Month Parkinson’s Coaching Package with the special offer. Hi Howard, truly love this post. Fabulous story, love the analogy. You ROCK at this my friend, you truly do. Los pensamientos dementes perturban. Dan lugar a un mundo en el que no hay orden de ninguna clase. otorgarle valor a lo que es completamente demente y no tiene significado. esto, me escaparé de todos los efectos del mundo del miedo porque estaré reconociendo que no existe. Insane thoughts disturb. Give rise to a world in which there is no order of any kind. give value to what is totally insane and has no meaning. this, I will escape all the effects of the world of fear because I will be recognizing that does not exist. buna jimmy.realiatea pentru mine este dura ,greu de acceptat,corpul este distorsionat,mersul nesigur,gandirea confuza,tratamentele un mare fiasco,dezamagire pe toata stradania de a te ridica de la pamint,realitatea? un vis urat din care nu ma pot trezi.DUMNEZEU,FORTA DIVINA ,O INVOC IN DISPERAREA MEA.SI ATEPT DE 1 5 ANI intre timp ma transform in mostru Care sau unde este culpa mea de am asa condamnare ? jimmy good. reality for me is tough, hard to accept, the body is distorted, staggering gait, confused thinking, treatments a big fiasco, disappointment throughout the endeavor to rise from the ground, the reality of a bad dream I can not wake up. God, divine forces, O my despair invoked. 1 AND 5 YEARS WAIT meantime I turn the monster What or where is my fault we have such condemnation? Leontina gracias es intenso lo que dices yo entiendo tu sufrimiento..y le envio toda mi compasion y amor. usted no es un monstruo, usted es un angel…..Todas las enfermedades son físicas, mentales y espirituales, y los más elevados niveles de recuperación son la consecuencia de abordar simultáneamente los tres niveles y viéndolos todos con igual importancia. La intención espiritual y contextualización aumenta el porcentaje de respuestas positivas del tratamiento estrictamente médico. Innata a la condición humana, sin embargo, son las inherentes limitaciones consiguientes al diseño evolutivo, algunas de las cuales pueden ser trascendidas y otras no pueden. Por tanto, la esperanza y la fe necesitan estar acompañadas por la entrega a y la aceptación de una Voluntad Superior. la vida no puede ser destruida; sólo puede cambiar la expresión de la limitada realidad lineal física a la ilimitada realidad espiritual no lineal……Por consiguiente, es obvio y simplemente de sentido común que la enfermedad es una expresión del dolor y el sufrimiento. El dolor y el sufrimiento se sitúan en los niveles más bajos de energía…lo que significa que tienen un efecto adverso en nuestra vida. Después tenemos que ver la naturaleza de la culpa, la culpa inconsciente, y cómo se expresa. Los sentimientos negativos tienden a ir de la mano, por lo que todos los sentimientos negativos luego contribuyen a la enfermedad, incluyendo el orgullo, la ira, el deseo, el miedo, el sufrimiento, la apatía, y la culpa. El sistema de energía de la acupuntura del cuerpo, a través de los doce meridianos principales del cuerpo, responde instantáneamente a todo lo que es negativo, ………. cualquier pensamiento o sentimiento negativo desincroniza el sistema de energía de la acupuntura del cuerpo, que es más sensible que el sistema nervioso central y mucho más rápido que el sistema nervioso simpático autónomo. esto representan la desincronización de los hemisferios cerebrales y un debilitamiento instantáneo del campo de energía del cuerpo. Esto luego lleva a todo el campo de energía y sistema de pensamiento del victimismo. Como personas enfermas, nos vemos a nosotros mismos como víctimas de la enfermedad. Por lo tanto, es importante darse cuenta de que existe la enfermedad, y existe la persona que tiene la enfermedad. Comprendemos entonces que la persona que tiene una enfermedad necesita cambiar a fin que desaparezca. dejamos de atacarnos a nosotros mismos por estar enfermos. lo que abre un espacio para que nos convirtamos en una persona dispuesta, que acepta y ama..
Una enfermedad no es más que nuestra conciencia llamándonos la atención sobre algo que necesita ser observado. Hay algo sobre lo que estamos sintiéndonos culpable,temerosos, o cualquier otra emoción negativa. Leontina it is intense because I understand what you say your suffering. I send you all my compassion and love. you are not a monster, you’re an angel ….. All diseases are physical, mental and spiritual, and the highest levels of recovery are the result of simultaneously address the three levels and seeing all equally important. The spiritual intention and context increases the percentage of positive responses strictly medical treatment. Innate to the human condition, however, are inherent limitations resulting evolutionary design, some of which can be transcended and others can not. Therefore, hope and faith need to be accompanied by the delivery to and acceptance of a higher will. Life can not be destroyed; you can only change the expression of the limited physical linear reality to unlimited spiritual reality nonlinear …… Therefore, it is obvious and simply common sense that the disease is an expression of pain and suffering. Pain and suffering are at the lowest levels of energy … which means they have an adverse effect on our lives. Then we have to see the nature of the fault, unconscious guilt, and how it is expressed. Negative feelings tend to go together, so all negative feelings then contribute to the disease, including pride, anger, desire, fear, suffering, apathy, and guilt. The energy system of the body acupuncture, through the twelve main meridians of the body, responds instantly to all that is negative, ………. any thoughts or feelings of sync negative energy system body acupuncture, which is more sensitive than the central nervous system and much faster than the autonomous sympathetic nervous system. this represents the desynchronization of the cerebral hemispheres and instant weakening of the body’s energy field. This then leads to the whole field of energy and thought system of victimhood. As sick people, we see ourselves as victims of the disease. Therefore, it is important to realize that there is a disease, and there is the person who has the disease. We understand then that the person who has a disease needs to change in order to disappear. We stop attacking ourselves for being sick. This opens a space for us to become a willing, to accept and love ..
A disease is only our consciousness calling attention to something that needs to be observed. There is something about what we’re feeling guilty, fearful, or any other negative emotion. Leontina, muchas veces yo tambien he pasado por la experiencia del miedo, pero gracias a Howard y su receta he aprendido a manejarlo. El miedo es un nivel de conciencia a ser abordado donde está, no en su expresión y extensión en el mundo -el miedo a esto, el miedo a aquello- y no tratar de controlarlo en el nivel de lo particular, sino manejarlo más bien como un nivel de conciencia. Esto se hace tomando consciencia de lo que somos, que es mayor que el miedo y aprender a dejar de identificarnos con la emoción porque no somos eso. Somos un campo global en el que el miedo está siendo experimentado. Este se convierte en una pequeña cosa que ocurre dentro del contexto más amplio en el cual nos volvemos conscientes de nosotros mismos como lo que realmente somos. Uno de los mayores obstáculos para gestionar y el dejar ir del miedo es el miedo al propio miedo. Hay una técnica que disipa el miedo al miedo. Una vez que ya no tenemos miedo al miedo, se convierte en un asunto muy simple. ¿No es el miedo al miedo el problema? Una persona que tiene miedo al miedo, al igual que la persona que va al dentista están preocupados por el dolor; ese es el temor inicial. Cuando empezamos a buscar la naturaleza del miedo, podemos ver que el número de miedos es interminable; por lo tanto, las personas se convierten en víctimas y se convencen de que el origen del miedo está fuera de ellos mismos. Cuando nos fijamos en el miedo, vemos lo omnipresente que puede llegar a ser. para que ya no te sientas como un pequeño ser que no tiene poder y está en el efecto al ser la víctima del propio miedo. El miedo puede ser como un prefijo que consigue pegarse a cualquier cosa. Al abordar el campo de energía del Miedo, empezamos a darnos cuenta de que el tener miedo puede unirse a cualquier cosa y a todo en nuestras vidas. No hay nada en nuestro experiencia plena como ser humano a la que el miedo no se pueda adherir. Queremos a nuestra madre, y surge el miedo de ―¿Qué pasaría si la perdiéramos?‖ Nos encanta nuestro cuerpo hasta que surge el miedo a la muerte o enfermedad. Nos encanta el dinero hasta que surge el miedo a la pérdida o el ser acusados de codiciosos. No importa lo que pensemos sobre algo, el miedo puede ser adherido a ello. Nos gusta nuestro automóvil hasta que surge el miedo a un accidente. Una persona miedosa une el miedo a todo; por lo tanto, todo lo que llega a la mente proviene de un campo de energía temeroso y por tanto se colorea de miedo. Existe incluso un miedo a la propia vida, como lo muestra la canción: ―Fraid of living and ―franid of dying – Temo vivir y temo morir‖. En otras palabras, este campo de energía ahora lo ha contaminado todo. Si nosotros somos el origen de ese campo de energía, entonces toda nuestra experiencia proviene del campo del miedo, y todo en nuestra vida puede convertirse en miedo. El futuro es terrible: la vejez, el envejecer, lo que va a pasar con el cuerpo, lo que va a pasar con mis finanzas, lo que va a pasar con mis relaciones, ¿qué le va a pasar a mi familia, que le va a pasar a mi cuenta bancaria, que le va a pasar a mi país, y que va a pasar al mundo? Las personas que desarrollan miedo global te hablarán de su miedo a la aniquilación nuclear, o las guerras intergalácticas, o meteoros, o catastróficos ―fin de los tiempos‖. La expansión del miedo no cambia el hecho de que todavía es sólo miedo. Exaltarlo y hacerlo parecer dramático no cambia el hecho de que es sólo miedo. Los miedos a la guerra intergaláctica, la demolición humana, y el fin de la raza humana no son diferentes al miedo del niño a la oscuridad o el miedo a que un perro pueda mordernos. Experimentalmente, el miedo siempre es la misma emoción. Característico a todos ellos es el campo de energía llamado Miedo. El Miedo a ―que‖ es en realidad inmaterial. Hemos de aprender a buscar entre los pensamientos y sentimientos. En realidad, hemos de buscar por debajo de las sensaciones el campo de energía del cual surge la sensación que se está originando y luego aprender a manejar este campo de energía. Cuando hacemos esto, perdemos nuestro miedo al miedo, y en la medida en que esto sucede, empezamos a aprender a manejar el miedo directamente. Es una cosa extremadamente sencilla de manejar una vez que estamos familiarizados con algunas técnicas fáciles. debemos aprender y a darnos cuenta a empezar a sentirnos realmente bien con nosotros mismos cuando nos demos cuenta de que ya no somos la víctima, el gusano que es el efecto de ese miedo omnipresente. El problema no es el miedo en sí, sino el campo de energía del miedo. Podemos empezar a ver que estamos controlándolo, porque nosotros somos el origen del mismo. Comenzamos admitiendo la verdad de que “Yo soy el origen del mi miedo”. Sabemos que en un estado de ánimo diferente, una cosa temible no es tan temible. Se podría decir acerca de lo que tememos, ―Tengo miedo de eso‖, pero cuando estamos acompañados por otra persona, o en un estado de ánimo diferente, con humor, y estamos pasando un buen rato riendo, entonces aquello ya no engendra miedo, así que el origen del miedo no está en el mundo. No hay manera de superar el miedo de uno al mundo, porque no hay manera de que el mundo pueda ser controlado para acabar con el miedo de uno, ni puede el miedo ser superado cambiando la sociedad, cambiando la ley, o cambiando las reglas. El origen del miedo está en el interior de uno mismo. Imagina un gran acontecimiento. Se dan dos aspectos -uno es el a empezar a sentirnos realmente bien con nosotros mismos cuando nos demos cuenta de que ya no somos la víctima, el gusano que es el efecto de ese miedo omnipresente. El problema no es el miedo en sí, sino el campo de energía del miedo. Podemos empezar a ver que estamos controlándolo, porque nosotros somos el origen del mismo. Comenzamos admitiendo la verdad de que “Yo soy el origen del mi miedo”. Sabemos que en un estado de ánimo diferente, una cosa temible no es tan temible. Se podría decir acerca de lo que tememos, ―Tengo miedo de eso‖, pero cuando estamos acompañados por otra persona, o en un estado de ánimo diferente, con humor, y estamos pasando un buen rato riendo, entonces aquello ya no engendra miedo, así que el origen del miedo no está en el mundo. Imagina un gran acontecimiento. Se dan dos aspectos -uno es el acontecimiento en sí mismo, y el segundo es cómo nos sentimos al respecto. Tener más policía en el acontecimiento podría hacernos sentir mejor, pero, de hecho, ¿a dónde iba la policía en el momento en que nuestro apartamento estaba siendo robando? Al otro extremo de la ciudad, naturalmente. Por lo tanto, nuestra gestión del miedo realmente depende de nosotros mismos. Surge de nuestra propia voluntad de que nosotros somos el origen de ese miedo, el cual está ocurriendo en el interior de nuestra propia conciencia. Por lo tanto, queremos dirigirla donde verdaderamente esta siendo experimentada. A medida que pasan los años, hemos acumulado la energía de este miedo. La energía tras este miedo aumenta la presión, y cuando llega a cierto punto, es como si la aguja hubiera llegado a una línea roja en el dial, y la presión de este miedo ahora empezara a expresarse. Se desborda sobre nuestra experiencia y comienza a colorearla. Si no lo examinamos, pensamos que este miedo está viniendo del mundo, y le echamos la culpa al mundo por ello. Creemos que es una experiencia espantosa pasando ahí fuera. Poco hacemos para daros cuenta que no es más que nuestro propio miedo el que está siendo proyectado al mundo. Entonces nos apropiamos de esta fuente de miedo, que es nuestro propio miedo acumulado. Empezamos a darle la bienvenida y esperamos la oportunidad para que este miedo salga. La liberación básica del miedo es por una gran entrega profunda. Leontina, many times I have also had the experience of fear, but thanks to Howard and his recipe I learned to handle it. Fear is a level of consciousness to be addressed where it is not in their expression and expansion in the world-fear of this, fear aquello- and not try to control it at the level of the individual, but rather as handle a level of consciousness. This is done by becoming aware of what we are, which is greater than the fear and learn to stop identifying with the emotion because we are not that. We are a global field in which fear is being experienced. This becomes a little thing that happens within the broader context in which we become aware of ourselves as we really are. One of the biggest obstacles to managing and letting go of fear is the fear of fear itself. There is a technique that dispels the fear of fear. Once we no longer have fear of fear, it becomes a very simple matter. Not the fear of fear the problem? A person who is afraid of fear, like the person who goes to the dentist are concerned about pain; that is the initial fear. When we started looking for the nature of fear, we can see that the number of fears is endless; therefore, people become victims and are convinced that the origin of fear is out of themselves. When you look at the fear, we see how pervasive can become. so that you no longer feel like a little being who has power and is in effect when the victim fear itself. Fear can be achieved as a prefix to stick to anything. In addressing the energy field of fear, we begin to realize that fear can join anything and everything in our lives. There is nothing in our experience as full human being to that fear can not be adhered to. We want our mother, and fear arises What would happen if we lost? ‖ We love our body until the fear of death or illness arises. We love the money until the fear of loss or being accused of greedy arises. No matter what we think about something, fear can be attached to it. We like our car until the fear of an accident arises. A fearful person joins the fear of everything; therefore, everything that comes to mind is from a fearful energy field and therefore is colored with fear. There is even a fear of life, as shown in the song: -Fraid of -franid of living and dying – fear and fear morir‖ live. In other words, this energy field now has contaminated everything. If we are the source of that energy field, then all our experience comes from the field of fear, and everything in our lives can become afraid. The future is terrible: old age, aging, what will happen to the body, what will happen to my finances, what will happen to my relationships, what will happen to my family, who will happen to my bank account, that will happen to my country, and what will happen to the world? People who develop global fear you talk about their fear of nuclear annihilation, or intergalactic wars -end, or meteors, or the tiempos‖ catastrophic. Fear expansion does not change the fact that it is still just scared. Exalt him and make it look dramatic does not change the fact that it is only fear. Fears of intergalactic war, human demolition, and the end of the human race are no different child fear of the dark or fear that a dog may bite. Experimentally, fear is always the same thrill. Characteristic of all is the energy field called Fear. The -que‖ Fear is actually immaterial. We must learn to look between thoughts and feelings. Actually, we have to look below the sensations the energy field which arises the feeling is originating and then learn how to handle this energy field. When we do this, we lose our fear of fear, and to the extent that this happens, we begin to learn how to handle fear directly. It is an extremely simple thing to handle once you are familiar with some simple techniques. we must learn and realize start to feel really good about ourselves when we realize that we are no longer the victim, the worm that is the effect of the omnipresent fear. The problem is not fear itself but the energy field of fear. We can begin to see that we are controlling it, because we are the origin. We started admitting the truth that “I am the source of my fear.” We know that in a different mood, a fearsome thing is not so scary. One could say about what we fear, I’m afraid that.‖, but when we are accompanied by another person, or in a different mood, with humor, and are having a good time laughing, then that no longer breeds fear, so the origin of fear is not in the world. There is no way to overcome the fear of one world, because there is no way that the world can be controlled to end the fear of one, or fear can be overcome by changing society, changing the law, or by changing the rules. The origin of fear is inside yourself. Imagine a big event. Two aspects, one is the start to feel really good about ourselves are when we realize that we are no longer the victim, the worm that is the effect of this pervasive fear. The problem is not fear itself but the energy field of fear. We can begin to see that we are controlling it, because we are the origin. We started admitting the truth that “I am the source of my fear.” We know that in a different mood, a fearsome thing is not so scary. One could say about what we fear, I’m afraid that.‖, but when we are accompanied by another person, or in a different mood, with humor, and are having a good time laughing, then that no longer breeds fear, so the origin of fear is not in the world. Imagine a big event. Two aspects are given, one is the event itself, and the second is how we feel about it. Having more police on the event might make us feel better, but in fact, the police where he was going at the time that our apartment was being robbed? At the other end of town, of course. Therefore, our fear management really depends on ourselves. Arises from our own will that we are the source of that fear, which is happening within our own consciousness. Therefore, we want to direct it where this truly being experienced. As the years pass, we have accumulated the energy of this fear. The energy behind this fear increases the pressure, and when it reaches a certain point, as if the needle had reached a red line on the dial, and the pressure of this fear now began to speak. It overflows on our experience and begins to color it. If you do not look, we think this fear is coming from the world, and we blame the world for it. We believe it is a frightening experience going on out there. Little do to give you that is nothing more than our own fear that is being projected to the world. Then we appropriate this source of fear, which is our own accumulated fear. We started and we hope to welcome the opportunity for this fear out. The basic freedom from fear is a deep surrender. Dear Leontina, many years we have been together in this community, reading each others’ comments. I want you to know that when I read this recent post, I felt so very sad my tears came, hearing of your terrible suffering and your despair. My heart goes out to you. My good wishes and prayers for your improvement are with you. Some days have passed since you wrote that, and my wish is that you are feeling some relief and have been able to shift from the dark place of despair. Certainly you are not a monster, and it is so sad that you would feel that. What comfort can I offer you, Leontina, in the face of your suffering ? Maybe only that I have heard you, and care about you and your experience. In the context of the post about the two wolves, it seems that the Evil Wolf has his teeth sunk into you. the us fight and win. I love the story of the two wolves! Great analogy! It definitely helps us on this road to recovery! Approaching recovery from a little different angle ! With much love and gratitude! You can’t explain the way to achieve Recovery more simple. Great analogy and so clear. inspiring. Doing my best to feed my Good Wolf, in the many ways you opened for me.